Accomplished Trial Attorneys Protecting Victims in Washington, D.C. The human brain holds more secrets than science can understand. When it is injured, the result can be seen immediately or may not manifest for days, weeks or months – perhaps even years. A traumatic brain injury can affect your future permanently, and victims may need additional therapies and medical procedures to help them recover. 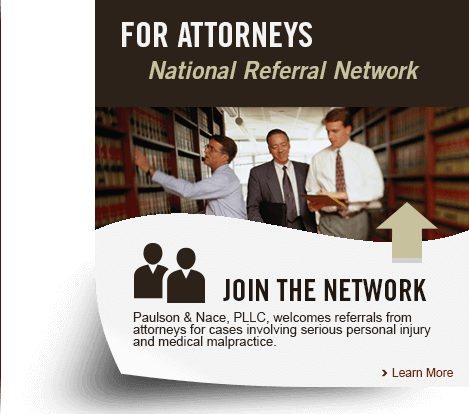 Paulson & Nace, PLLC, has successfully recovered compensation for victims of brain, head and neck injuries throughout Washington, D.C.. Our family advocates on behalf of yours to ensure that you can have a future, and that your loved ones are protected. You can trust us to always put your best interests first. The brain is cushioned in the skull by layers of membranes and fluid to keep it protected. A traumatic brain jury, caused by a broken skull or a concussion, can damage those layers or even the brain tissue itself. In some cases, the brain can heal with minimal medical attention; in more severe cases, however, the brain can be seriously damaged and may require a patient to undergo surgery or rehabilitation in order to heal. In the most tragic situations, the brain cannot heal, and a victim may suffer with permanent brain damage or pass away because of the injury. Motor vehicle accidents. A car, truck or motorcycle accident can cause a person’s neck to snap forward, and his or her head to smash into the dashboard or steering wheel. Motor vehicle accidents are among the leading causes of head, neck and brain injuries. Falls from heights. A fall from a great height, such as a scaffold or ladder, can fracture a person’s skull, or break a person’s neck. Physical violence. Being physically attacked is one of the leading causes of traumatic brain injuries. Certain athletes, such as boxers, football players and soccer players, are also at increased risk of a concussion. Slipping or tripping. Tripping over a broken sidewalk or slipping on a wet or icy patch of ground can cause a person to hit his or her head. Even slips and falls that seem minor could affect the brain. Falling objects. Construction sites with heavy materials or retail outlets who do not stock their upper shelves properly put people at risk of being hit with a falling object. These objects can fracture the skull or crush the vertebrae in a person’s neck. Because the brain and the spine make up your central nervous system, every injury involving the head and neck should be examined by a doctor. Some injuries to the cervical vertebrae or the brain could cause a spinal injury as well, rendering the victim partially or totally paralyzed. At Paulson & Nace, we examine and analyze your medical history to determine any links between your injury and other conditions that may manifest as a result. Some head and neck injuries can have lifelong consequences. At Paulson & Nace, PLLC, we fight on behalf of Washington, D.C. victims whose injuries could change their lives and their futures permanently. To schedule a no-obligation consultation, please call us at 202-930-0292 or contact us online to tell us your story.